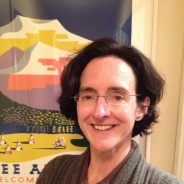 We’re delighted to announce that Carolyn M. Goldstein has joined University Archives & Special Collections as Public History and Community Archives Program Manager. Carolyn is an experienced public historian, having worked as a museum curator at Lowell National Historical Park and the National Building Museum in Washington, D.C. Her publications include Creating Consumers: Home Economists in 20th-Century America (University of North Carolina Press, 2012) and Do It Yourself: Home Improvement in 20th-Century America (National Building Museum and Princeton Architectural Press, 1998). Carolyn received her Ph.D. from University of Delaware, where she was a Fellow in the Hagley Program in the History of Industrialization. One of Carolyn’s primary responsibilities will be coordinating the Library’s public scanning project, the Mass. Memories Road Show. She will also focus on building partnerships with undergraduate and graduate programs on campus, especially the History Department’s Archives and Public History tracks, as well as developing ways to expand the Library’s engagement with and service to local communities. Upcoming Mass. Memories Road Shows include Lexington, on Saturday, March 16, and Stoughton on Sunday, May 5. Please visit openarchives.umb.edu for further information. This entry was posted in Announcements, Mass. Memories Road Show. Bookmark the permalink. where are the photos that were scanned into the collection from saturday, March 16th, in Lexington. There seems to be only two pictures. Thanks for contacting us about this. It typically takes UMass Boston archives staff about 2 months to fully process and incorporate images, stories, and other content from a Road Show event into the Mass. Memories Road Show collection. Keep checking this blog for up to date information. Feel free to contact us with any questions you have.